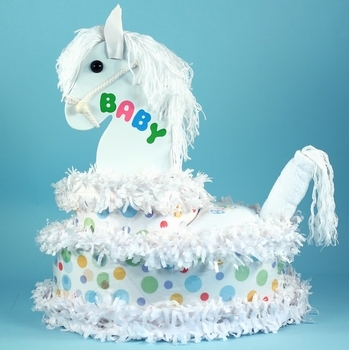 This unique diaper cake can be a terrific centerpiece for the baby shower. An ideal gift for baby girls and boys, this creation is a big one at 18 by 16 inches wide and 18 inches tall. It features high quality American made cotton layette items and more! The cute horsie on top is actually a 10 inch tall painted wooden wall plaque to hang in the baby�s room. Underneath, we add some essential items for mom to use right away. This gift can also be upgraded to a deluxe version where we add even more gifts for an extra $40.00. We assemble them to look like a little baby riding the horse making this cake even more useful and adorable! Click on More Images above to see the deluxe version. Knitted baby sweater and hat set. Each gift is also carefully gift wrapped prior to shipping.